The Eyes On show is back with this brand new edish son. 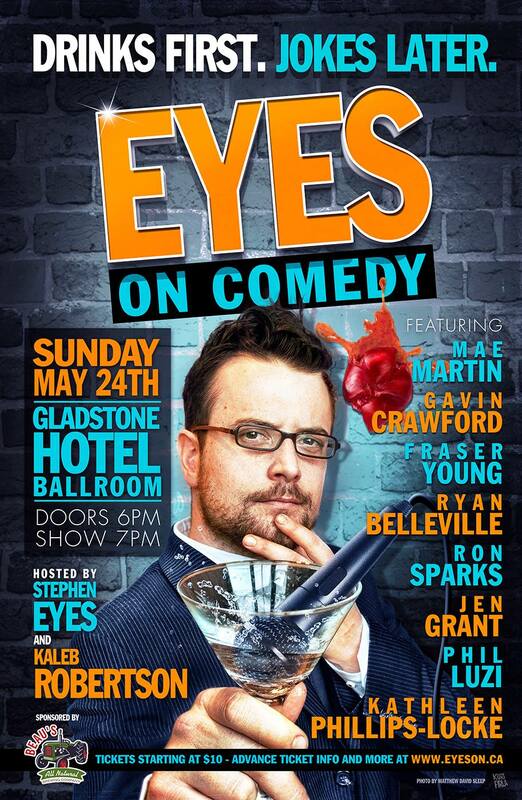 After our standing room only show at the Comedy Bar we’re heading back to the Gladstone Hotel Ballroom Sunday May 24, 2015 at 6pm. Don’t worry we’ll be back at Comedy Bar in July. Our June show is at the Drake Devonshire in Prince Edward County so this is your last chance to get drunk with Kaleb Robertson and I for a while. Oh and we have once again outdone ourselves on the line up. Like seriously it’s ridiculous, A lot of my long time favourites are returning and we’ve got some serious players we’ve never had before, check it! Mae Martin is in town for just a little bit working on her one hander for the Edinburgh Fringe Festival. She’s an absolute force and we thought we’d spare you the cost of a flight to Edinburgh and just show you the best bits. Gavin Crawford – Yup the one that had his own show on CBC cause he was so great on This Hour Has 22 Minutes. You might have also seen him on Red Green, Murdoch Mysteries or Murdoch Mysteries. Kathleen Phillips-Locke – Actress, Writer, Comedian. Kathleen does it all. You’ve seen her most recently on The Ron James show, Sunnyside and Mr. D. Whatever she’s doing she’s always great. Ryan Belleville – Another familiar face to the Eyes On faithful. He constantly straight up kills it. No joke, he’s one of the greats. JFL, Winnipeg and Halifax comedy fests. Winner of Canadian Comedy Awards and The Phil Hartman Award. Star of CTV’s Satisfaction and really mean boss to my good buddy Joe Dinicol on the LA Complex. Jen Grant – This is the first time we’ve had Jen on which is a shame because she’s done everything you can do in Canadian comedy: The Debaters, Just For Laughs, Winnipeg and Halifax Comedy fests etc. She’s done so much she’s had to move to the States for a bit and to travel abroad to entertain the troops. Now she’s finally bringing the funny to our stage. Phil Luzi – I caught Phil Luzi for the first time recently and he was pulling triple duty doing hosting duties while pulling off multiple characters to perfection and topping it all off with an amazing stand up set. Whatever he has in store for us it’s sure to be fantastic. Check out his work in Dr. Eddie on Funny or Die where he gets some of my other favourite comics on the couch.